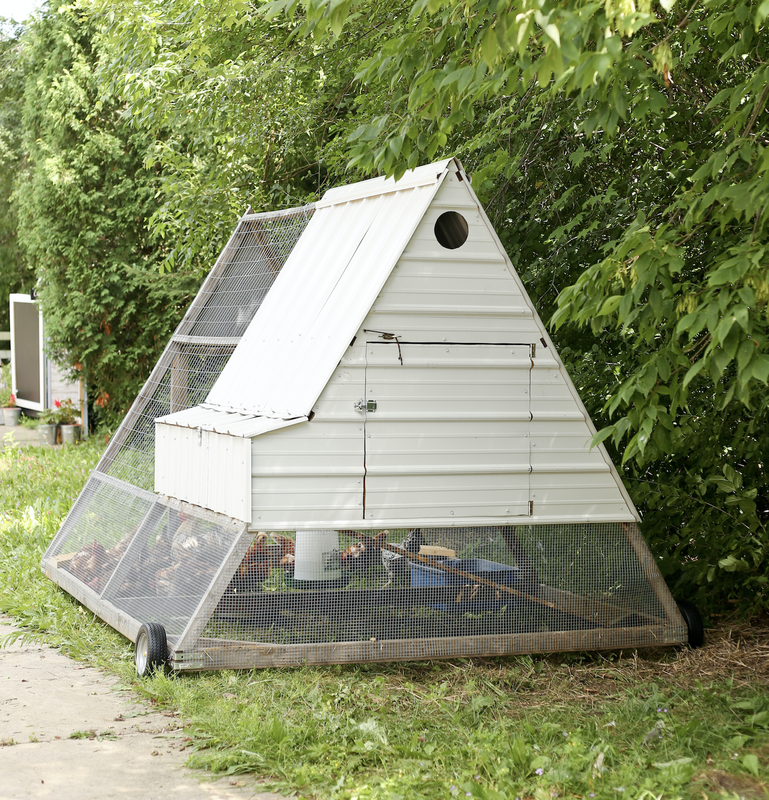 Whether you have 1/4 acre or 40, protecting your chickens from predators can be daunting. ​​ Here at Green Willow Homestead we knew we needed a structure that would protect our hens, but offered us the flexibility for them to have access to pasture. Predator pressure is a non-issue now that we house our flocks in the tractors. We have yet to lose a single hen. Our ladies get to fulfill all their chicken needs by scratching through the grass and clover, searching for bugs and worms to eat. Their yolks are a deep orange and our customers couldn't be more pleased. The tractor has a unique wheel design that went through many versions until we found the one that would last. We came up with this design all on our own and have yet to see other build plans online that utilize it. As a 135 lb female, I can move and turn these tractors on a dime, all by myself. Gathering eggs has been a breeze. We get about 5 dozen eggs a day and having exterior access to gather them has been essential to our efficient workflow on the farm. Having a mobile structure to move across the grass that is both aesthetically beautiful and sturdy is a godsend. From the A-frame design to the solid-rubber tires, this baby is made to last. We wanted to build it once and have it for the next ten years. 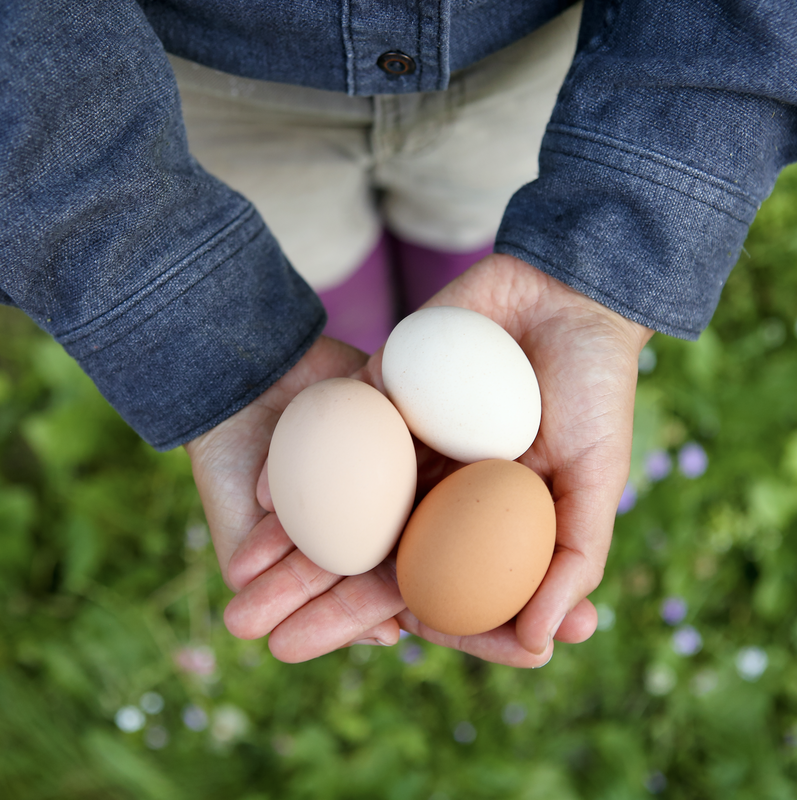 The chickens fertilize our pasture for us, creating a noticeable difference in the health of our land after just one month. The other added bonus is many cities have tight building codes and a mobile structure like this doesn't require a permit. Our city has a lot of red tape for building permanent structures so building a mobile tractor was the path of least resistance. White corrugated steel reflects the sun, which helps the hens stay cool during the day and then dry and warm if a storm rolls in. The roosting area has a ramp that operates on a special pulley system. The girls are shut up safe every night, allowing you to move the tractor without any hens getting in the way. 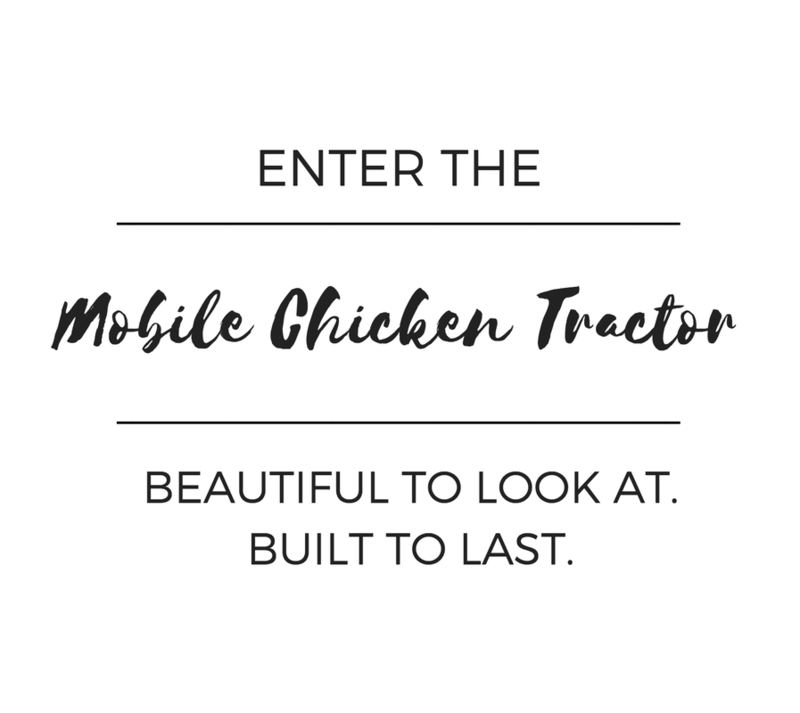 ​The tractor will comfortably hold 15 laying hens or 20 bantams (at maximum 20 hens and 25 bantams). We recommend moving the tractor at least once a day on a 30-day rotation, meaning square one doesn't get revisted for at least a month. If your space is a bit more limited, move the tractor just a half space in the morning so the hens don't have to pick through their manure from roosting the previous evening. I spent four months researching what we needed in order to merge the benefits of free-range eggs with the necessity of safety from predators. My engineering-inclined partner set work on CAD and drew up the entire design. ​One trip to Menards and an Amazon order later, we were on our way. We batch-built three tractors over the course of a month, but you could construct one tractor in two weekends. You will definitely need a second set of hands to help you with a few steps in the construction of the tractor. Q: In the photos we can see under some of the wood beams along the bottom. Do you not have small animals digging or squeezing under? A: We have never had animals dig under the tractor. During the day predators are mainly aerial - i.e. hawks. Obviously hawks cannot get to the birds in the tractors. At night, we've found that moving the tractor every day keeps predators on their toes. They can't make heads or tails of the situation when the tractor is in a different spot every night. No weasels, mink, raccoons, or coyotes have been able to dig under or break in. 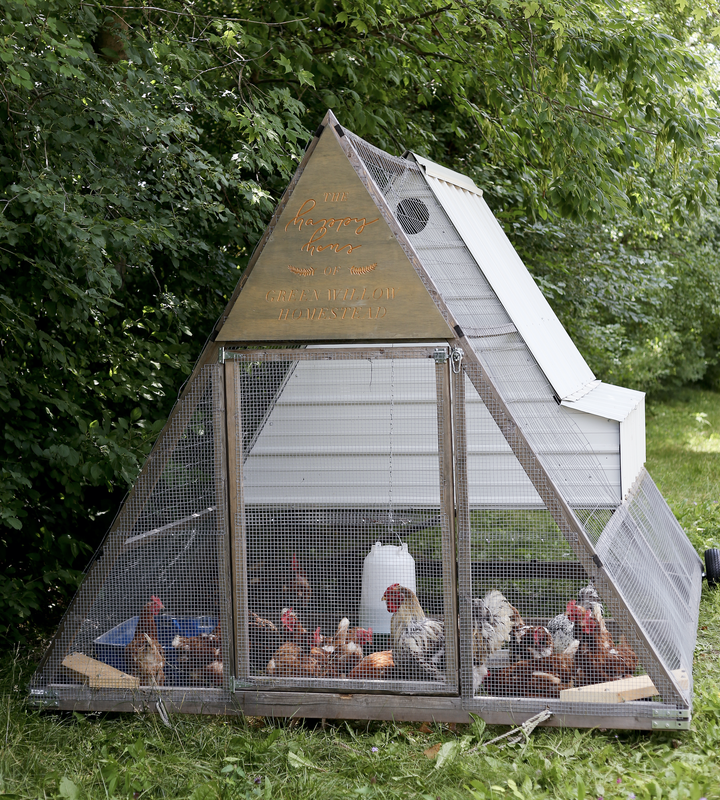 Q: At night, the chickens are tucked up in the enclosed, raised area - this has only a wire bottom, correct? So, if an animal got in via the areas of concern above , could it get through that wire under the roosts? A: Wire bottom, correct. 2"x4" wire fencing stapled underneath the roosts. Any smaller, and their manure would not fall through to the ground at night. Raccoons would be the only issue, but as mentioned, when the tractor is moved every day we confused their ability to "stake out" how to infiltrate the coop. I can't stress enough how much of a wildlife corridor we are in here in Franklin, WI and we have had zero predator issues with these tractors. Q: Do you have a cold winter? 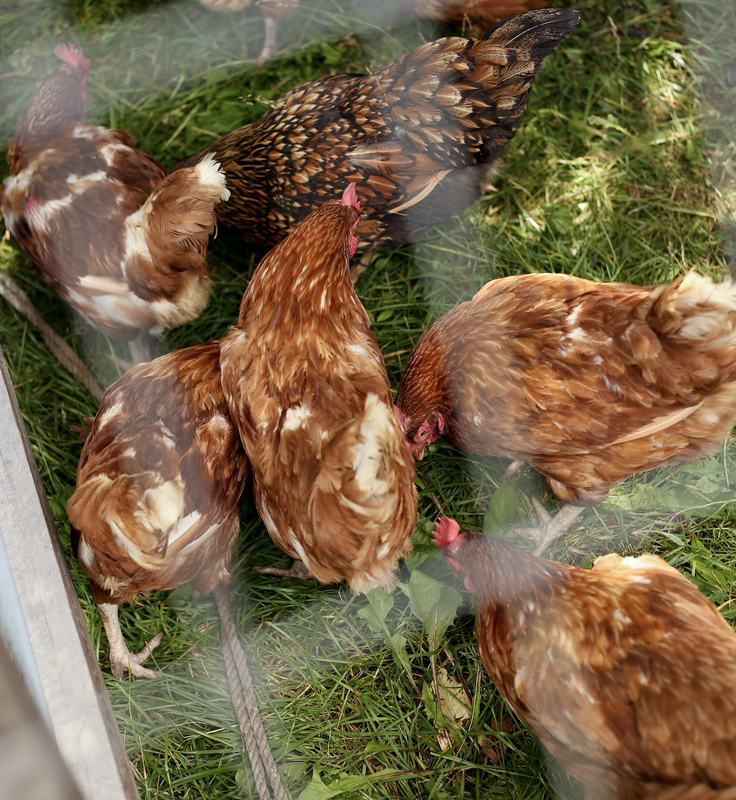 Do you move them to a stationary coop for colder months? A: Such a smart question! If your winters stay in the 20 F then the tractor would suffice. We get below zero F regularly in WI so we do see-saw our girls between a temporary coop in our barn in the winter and the tractors in the summer. I like giving the tractor time to "rest" so I can clean it thoroughly before another season. 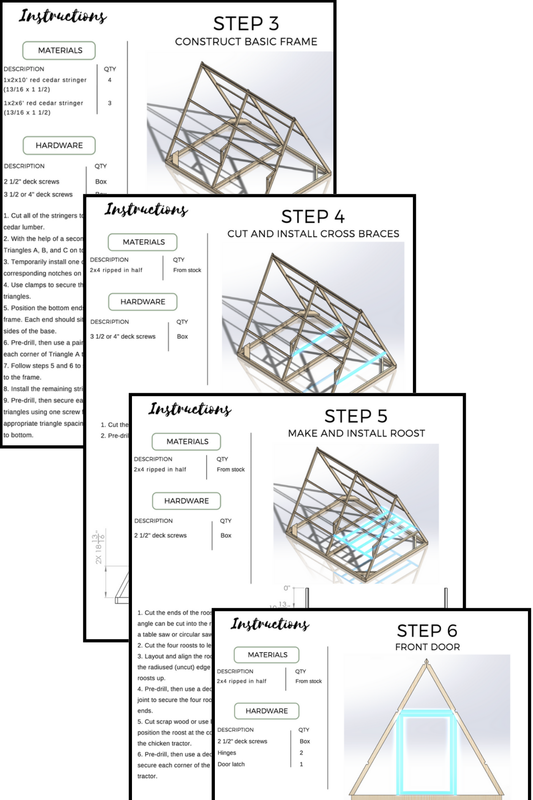 "The build plans are easy to understand and listed everything we needed, right down to the hardware and the tools. 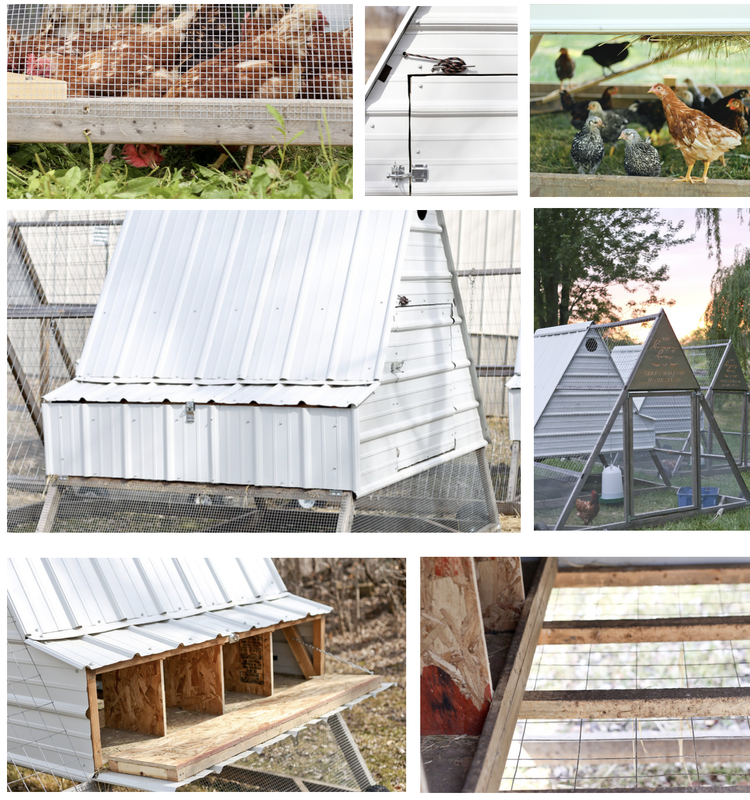 We saved a bit by using some repurposed materials, like the roofing, and overall our hens are so pleased!" "My family couldn't be happier with the chicken tractor we built using Kelsey's plans. Our chickens are safe, comfortable, and happy on our lawn. The build plans were straightforward and easy to follow. Thank you Kelsey!" ​ Let's build this thing! SHOW ME MORE TRACTOR INFO!